Sometimes a person comes across such circumstances in life which baffle him. He debates about doing or not doing a certain thing. As he is unsure at that moment and can’t decide what should he do? In such circumstance sharia instructs to get consultation from a wise well-wisher or the one with the expertise or insight about the concerned matter. In short, a person must not just rely on his own intellect or understanding before coming to a conclusion. He must make final decision after mutual contemplation and consultation and have faith in Allah. This process of deliberation and seeking experts advise on a particular matter is called mutual consultation. Above mentioned Hadiths conclude that a person must consult the concerned people before proceeding in a particular matter. Because if he does not consult and fails afterwards then people taunt and rebuke him. Sometimes an ongoing process of rebuking continues which results in shame and humiliation. However, had he consulted the expert before proceeding in his matter then he would not have failed. This is because Allah opens more ways in path of success for a person by virtue of mutual consultation. However, if one does not achieve expected result even after mutual consultation then he does not have to face embarrassment. Since not only his but the wisdom and recommendation of expert had also gone into the decision of that matter. In this case Allah certainly has a better plan for him. Meaning: Consultation is the absolute righteousness. One who contents on his own wisdom endanger himself. Hence concluded that mutual consultation is a very conspicuous act. In fact, it is guidance towards the right path which leads to success and well-being of an individual. As long as the system of mutual consultation exist, mischief, depravity and awry cannot make their way in the society. Eventually, this will lead society towards peace and prosperity. According to the current affairs only those educational and religious institutions progress more who make their policies with mutual consultation. As such institutions are free of any external or internal evil or mischief. However, when an institution or government is run by family or dynasty system then it does not last very long. As it follows the family succession system which does not give the right of opinion to people. Rather it is hereditary even if the successor is ineligible for the ruling position. Resultantly, this generates millions of problems. Thereafter, roguery and corruption swamp the whole city rather country. The dynasty system prevailed in the pre-Islamic era which destroyed and divided the families and tribes. Consequently, the immoral deeds flooded the society and there was no one to desist or stop it. As people were not worried about any accountability. They were free to do anything and everything. Resultantly, this gave birth to thousands of immortal deeds like adultery, alcoholism, robbery, looting, massacre etc. Basically, this verse outlines the characteristics of the Muslims. Here, one of the characteristics described is the mutual consultation. To elaborate, this verse instructs to get the consultation of the adept in important matters. Undoubtedly, faith and obedience to Allah distinguishes the true believers. Allah addressed this trait of the true believers in the first part of the verse. It describes their obedience towards the orders of Allah and His Prophet. Then the verse addresses the trait of mutual consultation which indeed proves its significance. That is why mutual consultation had become part and parcel of the Companions of Prophet, particularly the Caliphs. Actually, Prophet Mohammad (pbuh) does not need consultation from anyone. Qatadah (ra), Rabi (ra) and other interpreters interpreted the above verse in similar way. They think that this order was to honour the Companions and to grant them with inner peace. As, in Arab mutual consultation and seeking suggestion was considered honourable and worthy. Abu Huraira said that of all people he found Prophet Mohammad seeking mutual consultation the most. To elaborate, Prophet Mohammad always made decisions of important matters after consulting with his sacred Companions. Prophet Mohammad consulted his Companions about the prisoners of the battle of Badr. He consulted whether to release the prisoners after taking a sum of money or kill them. In the battle of Uhad, Prophet consulted if Muslims should defend from inside Medina or from the outskirts. Majority of the Companions suggested to defend from the outskirts of Medina, hence holy Prophet approved it. Similarly, Prophet Mohammad consulted in the battle of Khandak (Trench) and treaty of Hudaybiyyah. Not only that, but he also consulted Companions about what way to adopt to call Muslims at time of prayer. In addition to the above examples, history is full of many other times when Prophet Mohammad (pbuh) consulted his Companions. When Allah manifested Adam, He consulted angels to get their opinion. The detail of this consultation is available in sura Al Baqarah, verse 30. In fact, Allah does not need to consult the angels or anyone else. Allah just wanted to introduce the concept of consultation and its significance in the human beings. Hence, the creation must follow the Creator! Sadly, nowadays like other good deeds practice of Sunna of consultation has also vanished from our society and lives. Consequently, leaving a dreadful impact on the society. For instance, people fail in their matters despite all the efforts, hard work and trials leading to depression and devastation. One can see uproar and disturbance everywhere on individual and congregative level. Many times, people regret of not consulting after they have faced failure and loss. But there is not point of repenting then as it is too late to undo the damage. Actually, we need to develop the habbit of seeking consultation before making decision in important matters. This will make our hard work productive and fruitful. Indeed, by mutual consultation we obey Allah and His Prophet (pbuh). Moreover, it benefits in thousands of religious and worldly matters. 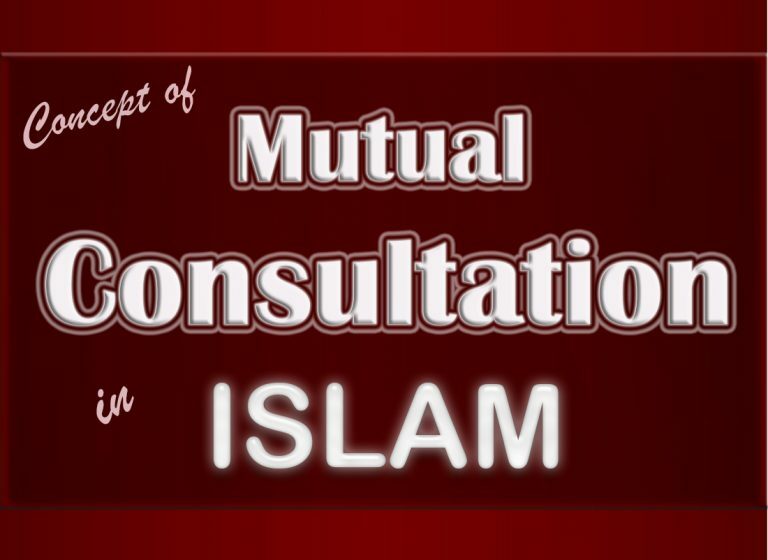 Hopefully, the Sunna of mutual consultation emerge in the lives and society of Muslim Umma. In What Matters We Do Not Need to Consult? Now the question arises that whom should be consult? And in what matters should we consult? In this regard remember that we do not need to consult about the already set matters of sharia. Also, the matters already declared mandatory or forbidden by Islam are out of question. For example, there is no need to ask if one should offer prayer five times a day or not. As the answer is obvious in Quran and Hadith. Similarly, no need to ask if one must perform pilgrim or not and pay zakat or not. As Allah has already set rules for these obligatory prayers in the sharia law. So, one must always follow sharia in these matters. However, one may consult about their procedure or way to perform them. Similarly, there are few things forbidden in sharia. For example, adultery, alcoholism, robbery etc. Therefore, one does not need to consult in these matters as well. One must always stay away from such forbidden acts. Ali ibn Abi Talib said that I asked Prophet Mohammad; what should we do after you if we come across a matter that is neither answered in Quran nor Hadith? One must consult not only in religious but also in financial, social, communal and individual matters. One should consult an expert in the concerned field. A person who has either experienced the matter or has complete know how of the matter. That being said, one must consult a perspicacious religious scholar in the matters of the religion. Similarly, in the spiritual matters one must reach out to a spiritual guide. Rather, a perfect spiritual guide who is the absolute light of guidance and the man of Divine Essence. Correspondingly, for the treatment of any physical ailment and disease one must consult a good medical doctor. In short, depending of the nature of the matter one must consult the experienced person expert in the concerned field. Because without experience only intellect cannot result in the success. Therefore, before seeking consultation make sure that person is both intellectual and experienced in the concerned matter. A person missing either one of the aforementioned qualities cannot be a good counselor. An unexperienced and unwise person does not qualify to be a consultant. Always consult the person who is experienced and intellectual about the matter in question. There is a major difference in the consultative system of Islam and democracy. The former looks upon on the eligibility or worthiness of the individual while the later just looks at the popularity. Democracy elects that party as the ruler who gets the most votes even if the voters are crazy and senseless. That is why, the democratic system is a very destructive. This system does not consider the intellect and wisdom of the candidate. This concludes that the Islamic sharia gives more weight to intellect and insight of an individual than to the majority. Select such person for consultation who is not only religious and pious but is also fearful of Allah. The person who does not fear of accountability in the court of Allah must not be trusted for consultation. As scholars say, notice if the consultant is sympathetic and kind towards others. Importantly, if he is insensitive, jealous or malicious towards the person seeking consultation then do not ask for his advice. Also notice if he is pious in terms of his thoughts and reflection. Additionally, keep in mind that an emotional person’s advice is not reliable. Finally, do not seek consultation from a person who has a personal benefit in the concerned matter. In short, the person seeking consultation must choose his counselor wisely otherwise it could result in loss instead of benefit. He must have a complete understanding or insight of the matter in question otherwise do not consult. If he does not have knowledge about the matter, he must honestly address his ineligibility to the person seeking advice. This will not disgrace or affront him rather Allah will reward him for his honesty and kindness. Additionally, this will also build his trust and reflect his honesty to the person seeking advice. Contrarily, nowadays people give their opinions in all matters regardless of their intellect. They just want to counsel others even if they do not have any knowledge or experience about the matter. Regardless of the fact that it may result in the loss of the person seeking advice. Truly, this is against their integrity. The counselor must fulfil his duty of counseling with complete honesty. People do not keep secret these days which is one of many afflictions of the present society. This results in fights, enmity and estrangement. Therefore, need of the era is that people fear from Allah, have social harmony and unity. The only responsibility of the counselor is to give an honest opinion. He cannot not enforce his opinion on the person seeking consultation. As the reason of seeking advice is to first see all the aspects of the matter. Then after thoroughly contemplating upon all aspects come to one conclusion. Obviously, a person cannot follow the advice of all the people he consulted in the matter. Therefore, he has the choice to adopt one way which in his point of view is the best. Hence, the consultant must not feel grieved or disappointed if his opinion was not followed. Indeed, Holy Prophet is the best counselor. Since, it was just a suggestion, therefore, Bareera decided not to agree and Prophet Mohammad was not upset about it. The above-mentioned Hadith is very educative for the present era. Since, now a trend has been set to enforce personal opinion on others. This has led to inundation of mismanagement and malpractice everywhere. Therefore, one must consider one’s opinion ordinary and not the ultimate decision so the other person can get maximum benefit. On the treaty of Huddaybiah when Muslims were forbidden to continue Umrah, Prophet Mohammad ordered everyone to take off Ihram. However, the Companions were a little reluctant. Therefore, Holy Prophet consulted his wife Ume Salma about the matter. She suggested; the Companions have zealous emotions at the moment, therefore don’t worry about their response. If holy Prophet take off his Ihram the Companions will follow.” This suggestion worked and following Holy Prophet, the Companions also took off their Ihram. Ume Salma was Holy Prophet’s wife and younger than him but at the time of need he consulted her. The crux of the discussion is that one must mutually consult in all important matters. Since, this is the order of Allah, Sunna of Holy Prophet and the way of the perfect friends of Allah. Moreover, consultation lead to the auspiciousness and Divine grace in the concerned matter.